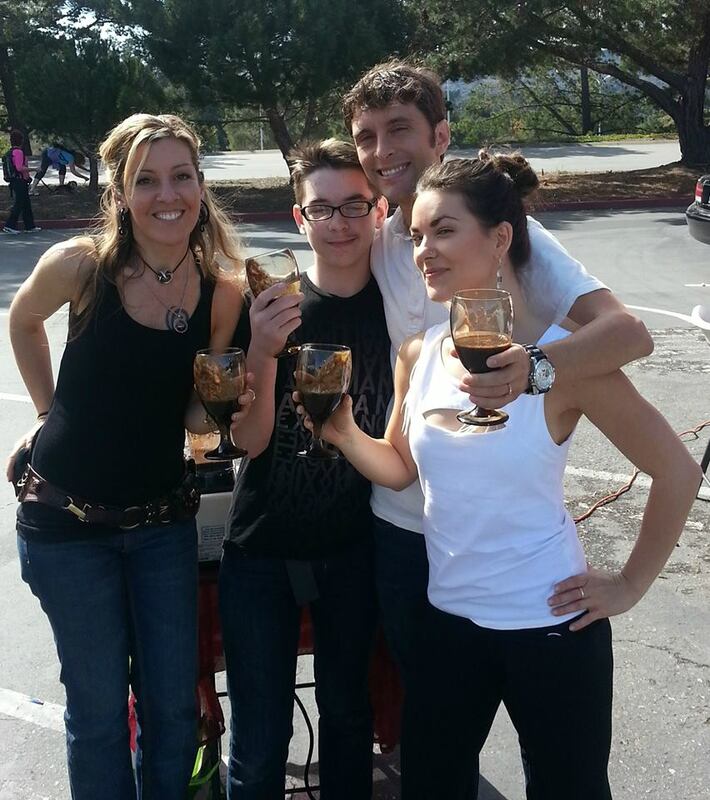 My husband Joe, our son Joey, Jillian and I went on a mission to make the ultimate sensual food smoothie in the middle of the Saturday San Mateo farmer’s market. You’re invited to come on the journey with us, as we filmed the process! Take this recipe as a loose outline. Get creative. If you haven’t already made the discovery, blenders are amazing appliances. You can toss in any green leafy vegetable to amp-up the nutrients in any blended drink. I love to experiment. I worked in a juice bar for years at Willy Street Coop in Madison, Wisconsin. We blended interesting concoctions all day and explored what flavors and textures were the most pleasing for the palate. The best way to learn what ignites your senses is to play! Maybe there’s a brightly colored exotic fruit that has caught your eye at the grocery store, or farmer’s market? 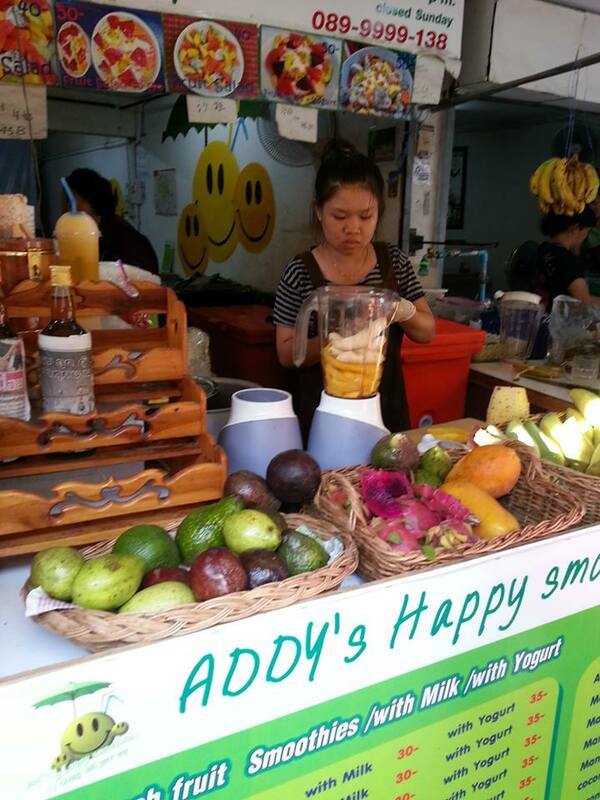 While traveling in Thailand this past summer, I was blessed to find an incredible smoothie stand in Chiang Mai (northern Thailand). The selection of fruit was incredible, and they were open to exercising their mixology skills. 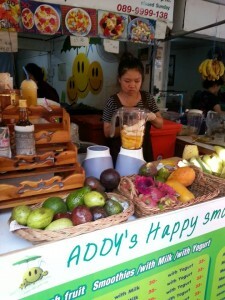 I tried Durian fruit and Mango; papaya and dragonfruit; coconut and papaya; avocado and coconut…there were so many delicious combinations! Making smoothies is a simple and quick way to start loading up on more sensual foods-the foods that nourish the body and soul and ignite the senses! I know that they aren’t a whole boatload of smoothie stands and durian fruit on every corner here in the U.S. , but we certainly have incredible options. I highly recommend having greens in your blended drink. Spinach and kale are my favorite leafy greens to blend in when time allows. If you’re on the go, get the greens in by adding a powdered superfood complex. I’ve felt phenomenal lately, loading up on the Health Force Nutritionals Vitamineral Green powder. It’s crucial to get these nutrients in your daily diet. This claim from the company: “Vitamineral Green™ is a superior, nutritionally dense, therapeutic green superfood powder which nutritionally supports blood sugar, detoxification, the immune system, liver, kidneys, blood, bones, colon, pancreas, muscles, brain, regularity, circulation, and longevity. *” Is only a claim, until you try it out and notice how you truly feel! I can attest to this claim. My mother was an herbalist as I was growing up, and I feel fortunate to have tried a plethora of superfood powders. Taste is certainly an important factor. I’ve cringed after gulping down many green drinks. I have to admit, I love the flavor and texture of the Vitamineral Green. Joe mixed it up in water for me the first day I tried it, and I’m totally hooked. I felt like I had super powers! You certainly don’t have to take my word for it, find out what works for you. Try out whatever appeals to you-just get the greens in! yum! Hug and drink your greens for breakfast! Here’s the exciting news. Jillian Love, Bethanne Wanamaker, my beloved, Joe Mattia and I will be leading a Spring Cleaning, Full Moon retreat to revitalize, renew and restore body mind and soul. Join us on March 16th in the enchanted forest of Woodside, California! Check out the event on eventbrite! *this event has passed, but please follow to find out when you can attend the next event!